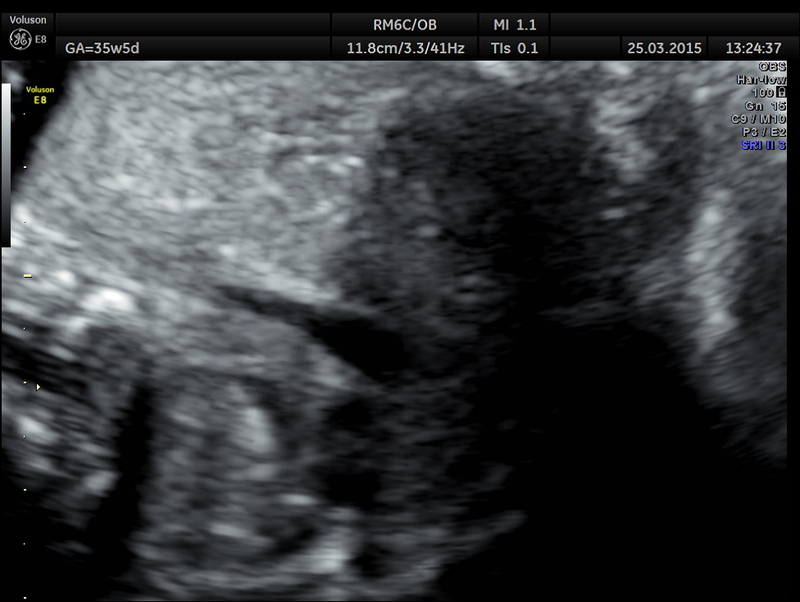 This was a 36 year old lady , gravida 4 , para 1 , live 1 ( normal child ) and abortion 2 ( MTP ). 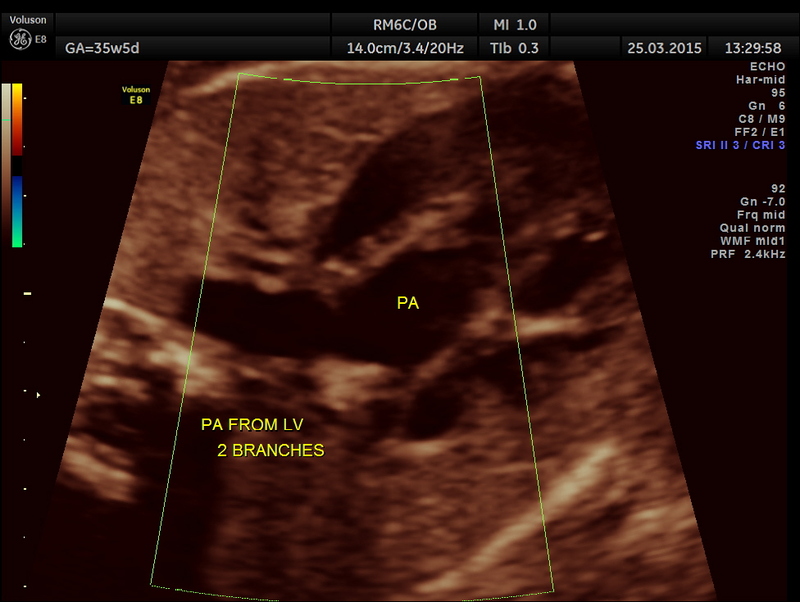 She was referred for 2nd opinion for cardiac anomaly suspected only at 36 weeks of gestation. 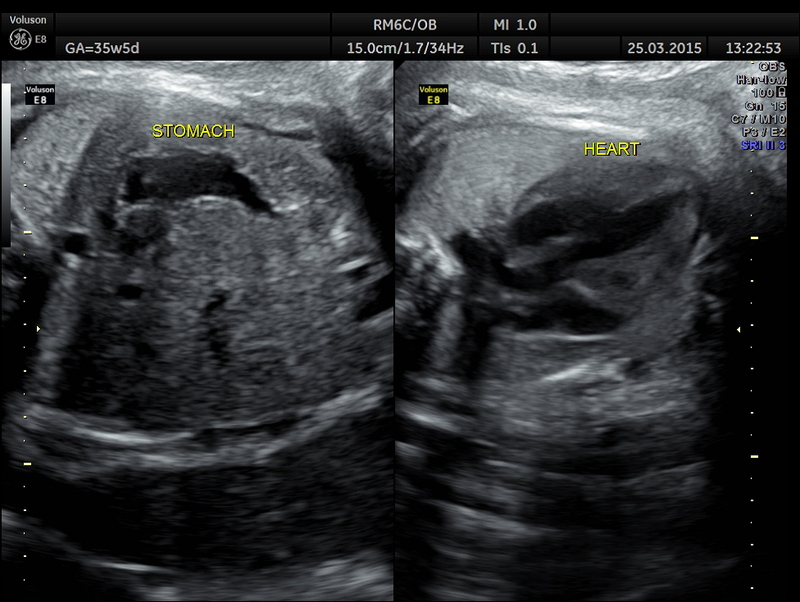 She had earlier undergone scans thrice , but no abnormality was suspected. The following findings were seen. 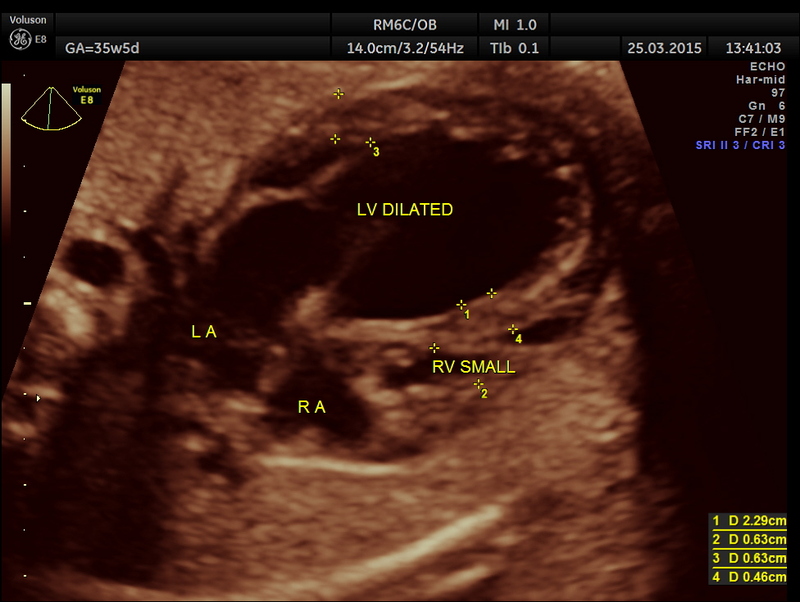 Cardiomegaly with dilated left ventricle and small right ventricle were obvious. The artery coming out of left ventricle branches into two – suggestive of pulmonary artery. 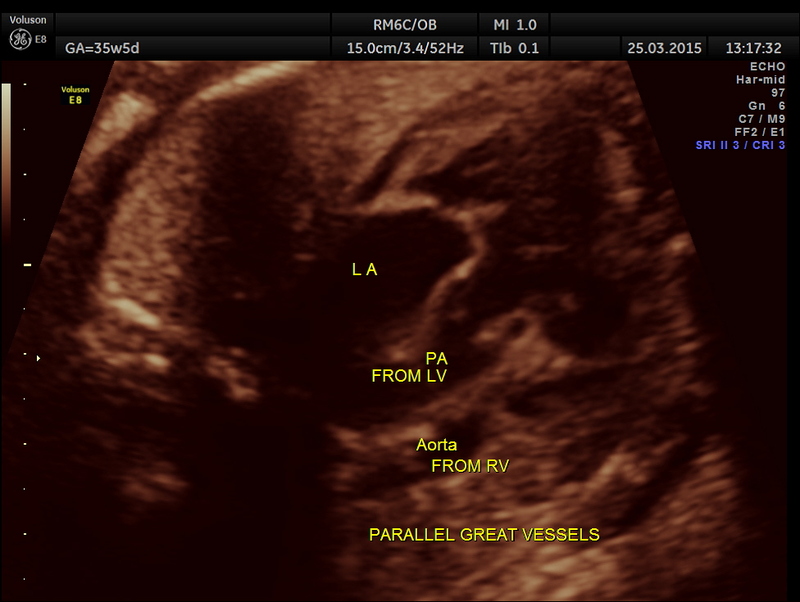 The great vessel arising from the right ventricle instead of crossing runs parallel to the vessel arising from the LV. Ventricular Septal Defect is seen. 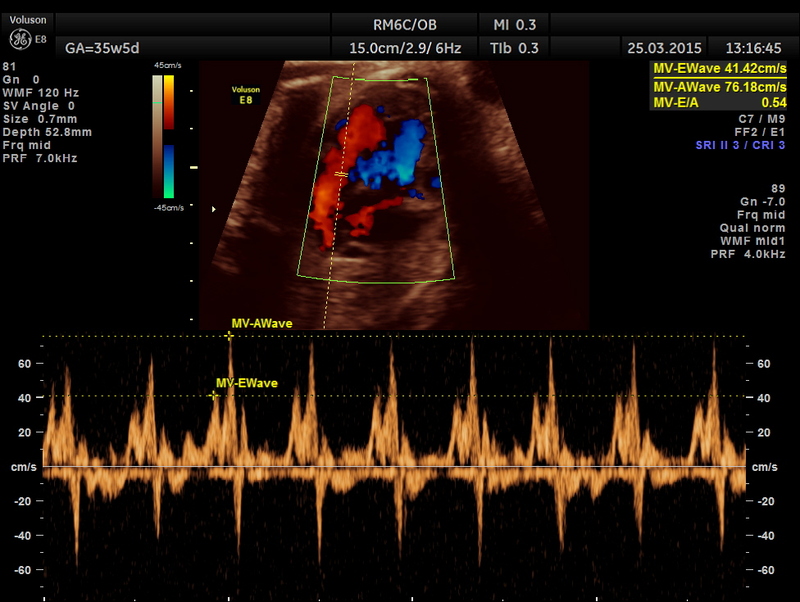 The following picture shows a normal situs and axis . The great vessels running parallel are also seen. In the three vessel view , single big vessel is seen in a plane. 3 vessel view shows only a single vessel in a given plane. 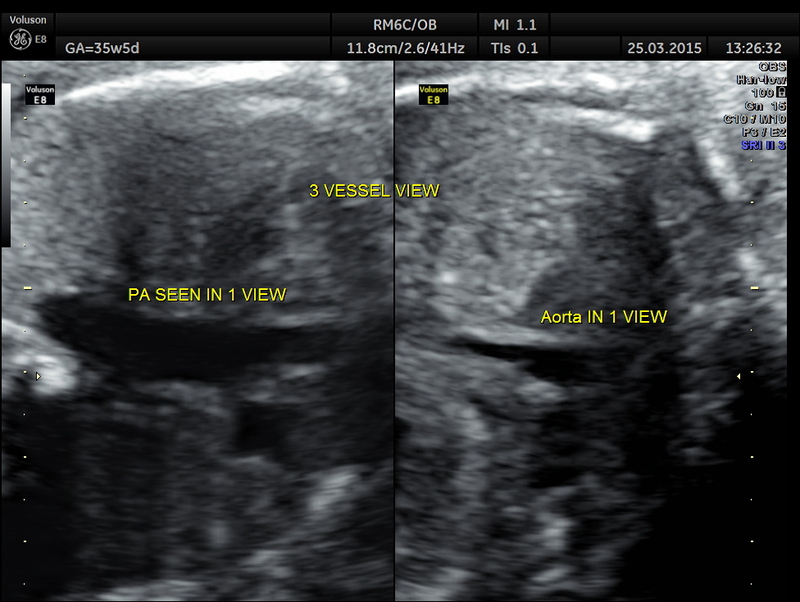 This shows normal veno atrial and atrial ventricular connections ( concordance ) and ventricular arterial switched connections (discordance). 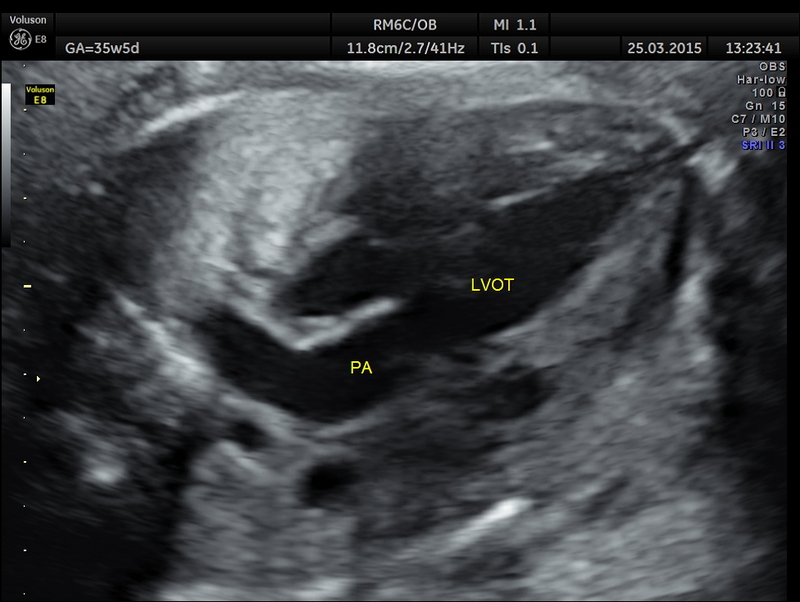 The 4 chamber view showed LV to be dilated. 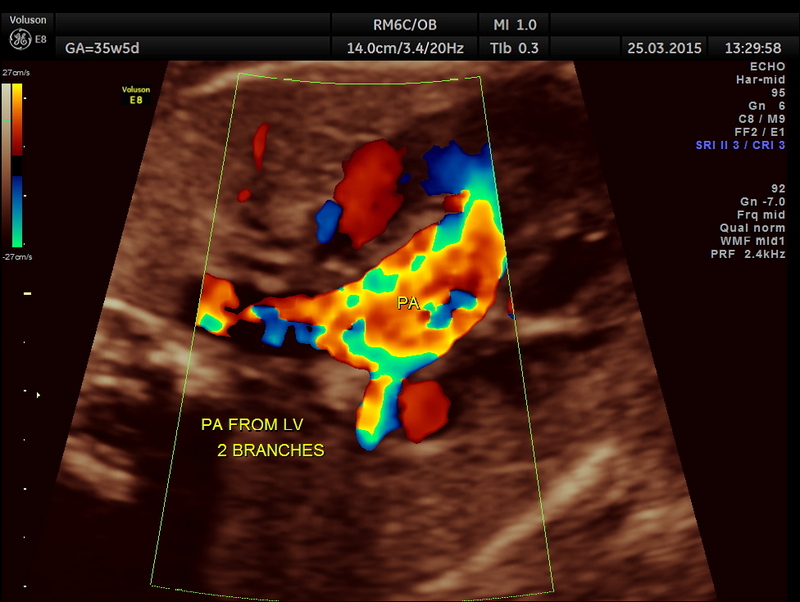 The great artery arising from the LV branches into two suggestive of pulmonary artery. The great artery arising from the hypoplastic right ventricle runs parallel to the artery arising from the left ventricle. 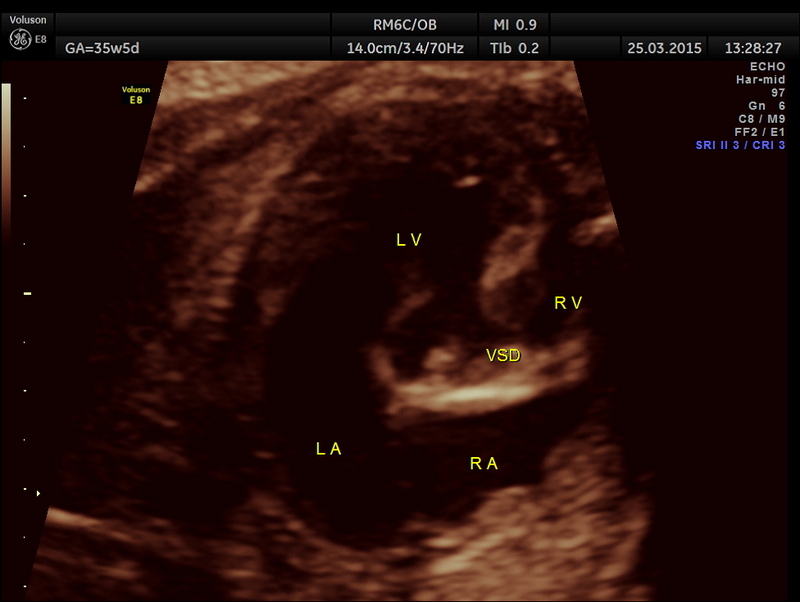 Ventricular Septal Defect is seen . 3 Vessel trachea view show only one great vessel in a given plane. 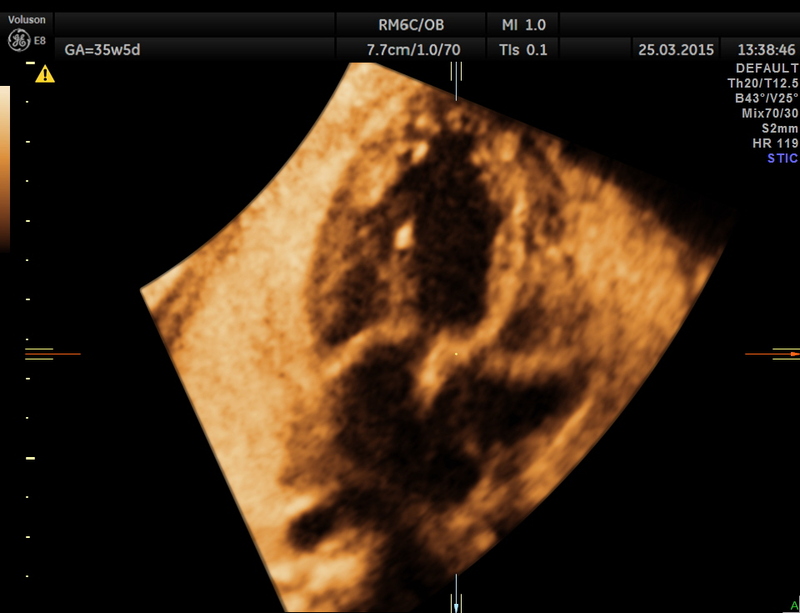 In this patient the dilated left ventricle and the hypoplasia of the right ventricle are probably unusual findings in Transposition of Great Arteries. In this blog another case of T.G.A. has been reported earlier . 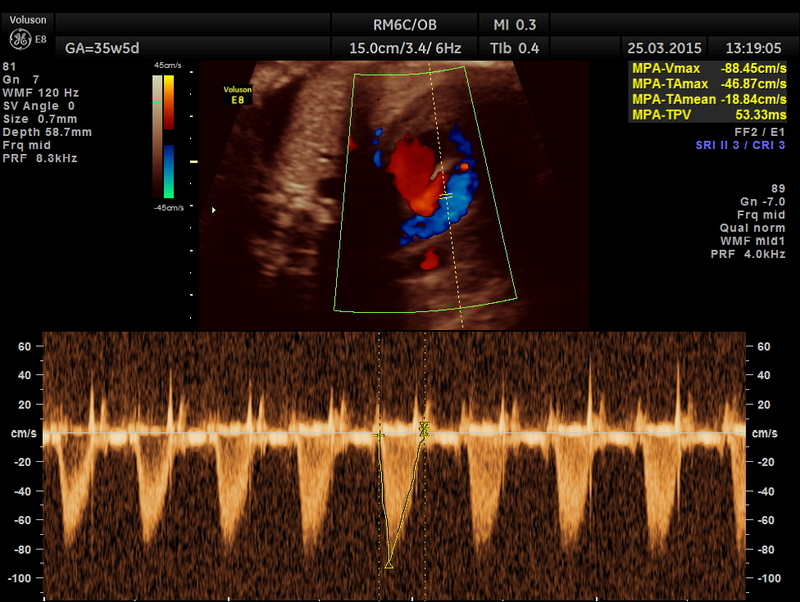 Despite its overall low prevalence, transposition of the great arteries is the most common etiology for cyanotic congenital heart disease in the newborn. 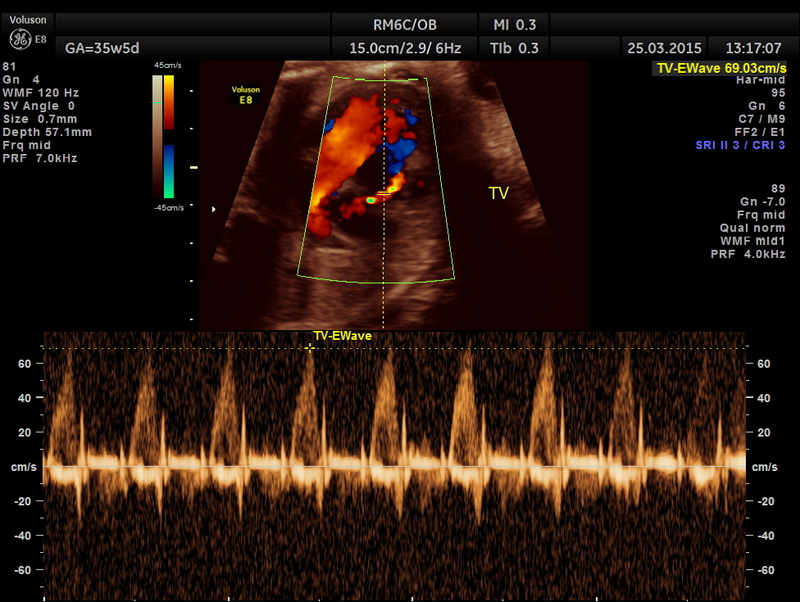 This lesion presents in 5-7% of all patients with congenital heart disease. The overall annual incidence is 20-30 per 100,000 live births, and inheritance is multifactorial. Transposition of the great arteries is isolated in 90% of patients and is rarely associated with syndromes or extracardiac malformations. 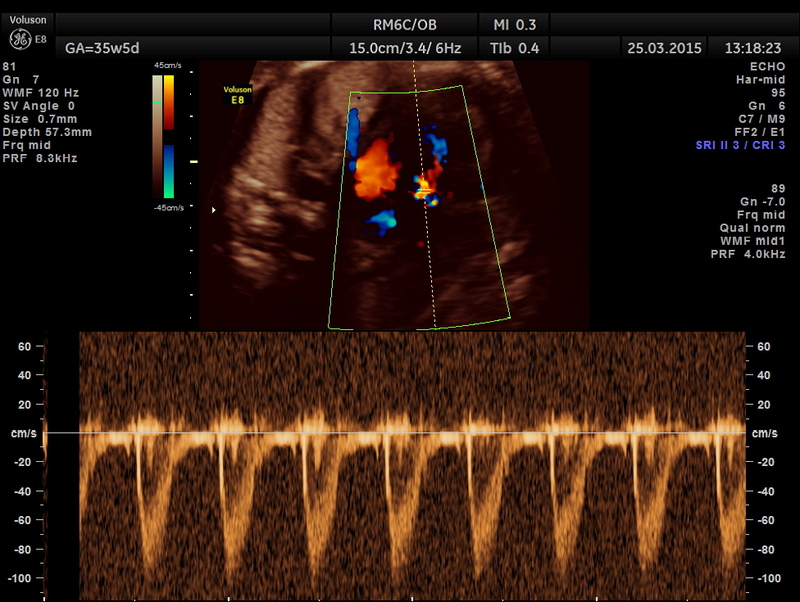 This congenital heart defect is more common in infants of diabetic mothers. 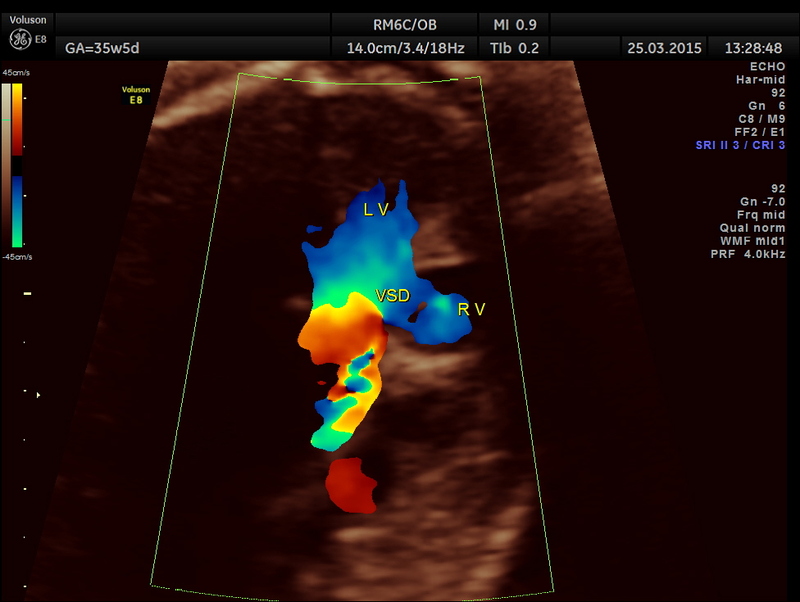 (4) transposition of the great arteries with ventricular septal defect and pulmonary vascular obstructive disease. I believe that TOF is the most common cause of cyanosis in the newborn. 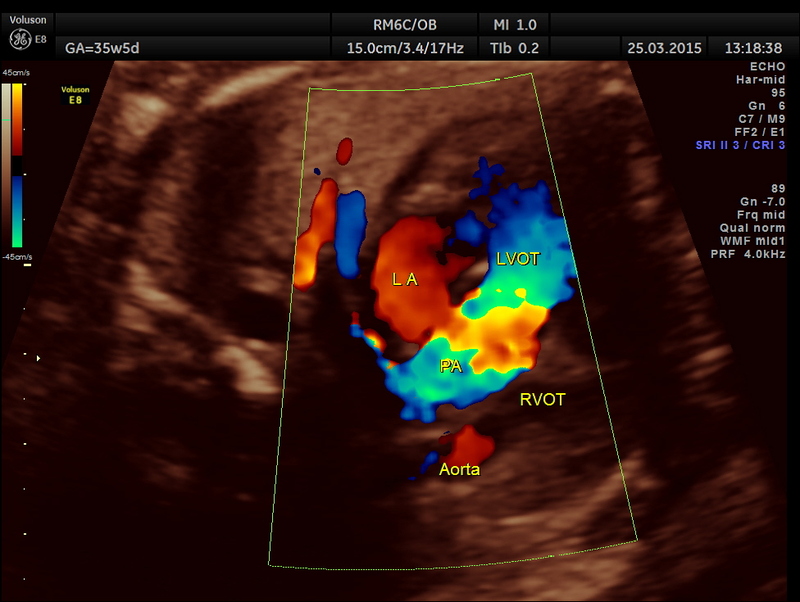 Also am curious as to whether you were able to show the aorta connected to the small RV and whether there is conal tissue. What was final diagnosis at time of birth. Interesting case. Thanks for sharing.